We sat down with Kacey Weiniger, Chief Marketing Officer of Across Realities, to learn more about Spatiate and the bright minds behind it. Spatiate makes the world your canvas with multi-user art creation and more in spatial computing. Today, the team at Across Realities launched Spatiate on Magic Leap One. The product of a small team of devoted creators. Spatiate demonstrates the magic that can happen when you combine a multi-user experience with artistic expression. We sat down with Kacey Weiniger, Chief Marketing Officer of Across Realities, to learn more about the experience and the bright minds behind it. The Spatiate team demonstrates multi-user presence along with their artwork, sketching up a spatial computing photo booth. Tell us all about Spatiate and what makes it special. Spatiate opens up a new avenue for creative expression. It takes those magic moments that many of us felt the first time we drew in VR and brings it into new mediums. Through spatial computing, we can now paint 3D art seamlessly within the real world. Spatiate is especially magical when experiencing it with others, allowing users to share co-presence and draw together. Whether in the same room or far away, users can create, occupy, and share their own digital reality. It integrates with legacy technology too, allowing users to participate from their mobile phones. This makes the technology available to all kinds of users and groups of all ages. What is your vision for how people will use Spatiate? Spatiate is an art creation tool, much like a crayon or a paintbrush, with the world as the canvas. It is an outlet for making freeform art within mixed reality and allows for endless experimentation of ideas. We love seeing what people are coming up with as they share their art online. As a communication tool, people can use Spatiate to collaborate and rapidly convey their ideas. In fact, we used these features to design the UX inside the app itself and have been holding our team meetings in there ever since. Tell us about the team behind Spatiate. Spatiate was conceptualized by Across Realities, a company co-founded by indie devs Steve Lukas and Alexandria Heston. It was built as a mobile-first app to democratize 3D art creation and sharing, but really recognized its potential when Magic Leap One launched. 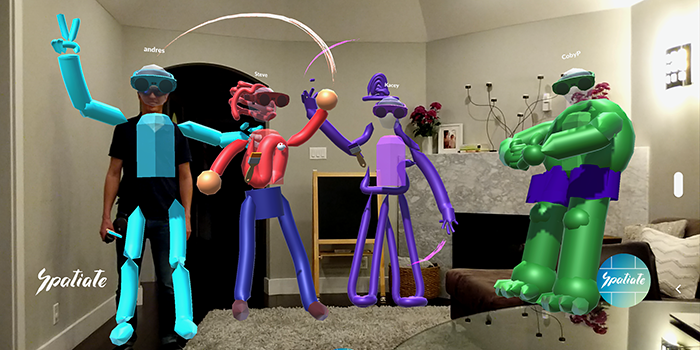 After sharing videos online of early Spatiate iterations, they found similarly passionate Magic Leap developers in the form of Andres Ornelas, JJ Castillo, and Tony Ramirez. Through showcasing shared experiments, these five strangers unexpectedly found Twitter fame as the first #LeapSquad. When it came time for Steve and Alexandria to each move on to join Magic Leap, the #LeapSquad stepped up to continue the creation of Spatiate, with Andres leading the development and JJ providing art and sound assets. Not only that, the larger #LeapNation community got involved as well. Alex Coloumbe and John Hanacek battle tested the app for months, with Tony Rogers, Andre Elijah and Darcio Bressiani being super supportive and vocal after they played an early version at L.E.A.P. Conference. As CMO, I've been extremely fortunate to watch all of this come together. I've been personally following VR and AR for several years, and have never seen a community rally quite like this. This was absolutely a team effort. What is next for the Across Realities team and Spatiate? Our plan is to continue rolling out support for other platforms, as Spatiate is already prepped for deployment on most VR and AR devices. You may see a few more surprises along the way as we explore deeper partner integrations with the industry. Beyond that, we see a lot of potential for the AcrossXR platform to deliver more apps of this nature, focusing on collaboration, accessibility, and innovation in spatial computing. We’re excited to bridge the gap between the high-end premium headsets and the greater mobile market, as we believe all immersive content should be made available across all realities. Find Spatiate on Magic Leap World for download today, and follow them on Twitter for the latest information on the app, including availability across different platforms.